This week for Linda's Grungy Monday Challenge, she's sending us over to watch Tim Holtz as he demonstrates Adirondack Alcohol Inks. There's so many different ways to use Alcohol Inks, and I already knew I wanted to use a scene image, so I created my background using the Alcohol Ink Mono Printing Technique. 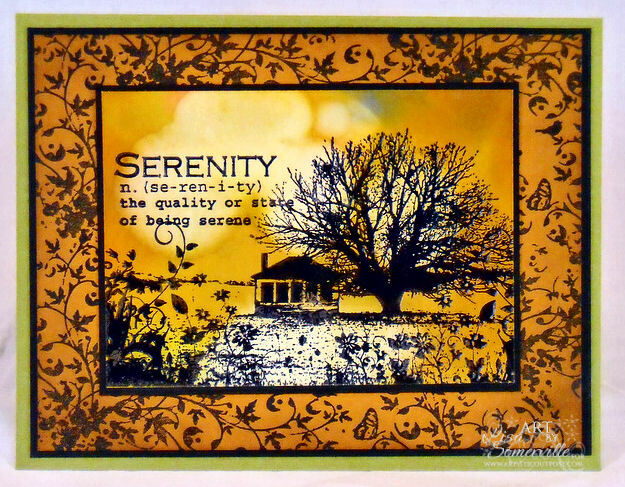 After creating the BG, I embossed the image from the Artistic Outpost Serenity Plate, which happens to fit the Simon Says Stamps and Show a Word Challenge. Using a SAMJ and the flourish image from this same set, I created the BG on Mustard card stock. Beautiful in mustard! When are you going to move to that serene place? This is fabulous! What a great background in alcohol inks. It is perfect for the scenery stamp (gorgeous stamp I must say). And I love your swirls on the second background! Great job with this weeks challenge! Hot and Beautiful! This gorgeous scene so reminds me of a hot summer day! Wonderful design! Such wonderful images. I really love the rich warm tones and the composition. The border is prefect and that flourish is the perfect finishing touch. Beautiful work. Thank you so much for sharing your work with us at Simon says Stamp & Show. This image is so special...and the AI background works beautifully. Fabulous "swirl" layer, too! An outstanding piece ! your technique is truly inspiring. The border and the flourish are heavenly. love how the background looks! Gorgeous card and fabulous color palette! Your stamps are awesome, love the flourish. Really warm feel, goes well with the sentiment.